Found the case to be just what I was looking for, after always using Otter box cases, I took the plunge and bought this. Only trouble is the glass has cracked about three days after fitting, that's why it doesn't get the f7ll five stars. Nothing much,the information about the product sells itself. Cover is great. Rubbery corners with modest grips on back but not bulky. Used otterbox for last 3 phones but this is neater and still feels safe. Screen protector needed a but of manipulation to get a sweet fit. Threw away the belt clip gizmo. Personal taste. 1 month in now and no complaints. Weird. Innit? I actually like the product and have had one before on a different sized phone and would recommend it to my friends. Having said that, it was in my hands 2 seconds before the plastic piece that holds the kickstand in place when opened broke in half. Although customer service was very responsive, not worth the time and expense to return It to England as I am in the US. 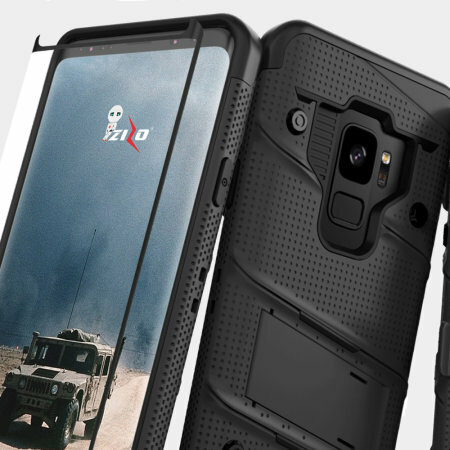 Lovely rugged case but the screen cover does not allow full functionality and therefore unusable. Returned for a refund. The tempered glass screen protector may well protect the screen but also protects it from being used, The edge keys have to be pressed very firmly for them to actually work. I have since removed the protector. Slim, sleek design and not to bulky. The only thing is that I've had the phone case for a few days and already broke the kickstand because of how flimsy it is. Screen protector fits well with the case! Looks nice and not too bulky or heavy.